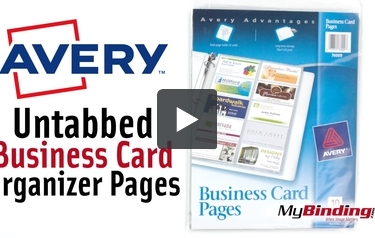 These Avery Business Card Pages will help get you organized in a flash. Each page holds up to 20 business cards 10 on each side and is prepunched for storage in a three-ring binder. The pages are archival save and acid free so they won't lift print off the inserts or cards. Soon every business card in your collection, from business associates to your doctor to your favorite hairstylist, will have its own place. With these pages, organization becomes a simplified success. I searched high and low for business card pages at a reasonable price. It was getting hard to keep paying for the Rolodex or Office Depot brand pages. These Avery pages are just as good and cost WAY LESS!! !